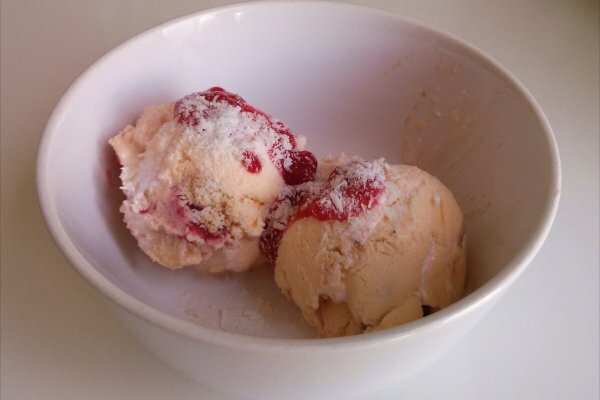 This post started life as Jammy Dodger ice cream, but while vanilla ice cream with bits of biscuit and jam sounded OK in theory, in practise it just wasn't all that interesting. But luckily the project then morphed into something altogether more exciting and tasty. I know them is Jamborees. Others may know them as Jam Mallows. And apparently in Ireland they are called Mikado (for some inexplicable reason). 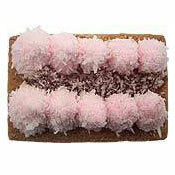 But the concept is the same - rectangular biscuits, covered in raspberry jam, pink marshmallow, and coconut. While all the cool kids at school were sneaking off for a cigarette at lunch time, I have fond memories of popping down to the local shop to buy a packet of Jamborees, and promptly scoffing the whole lot. It's a mystery how I wasn't the fattest kid in school. But I digress... it's another classic biscuit that I haven't seen in years, so a perfect candidate for a retro biscuit ice cream. 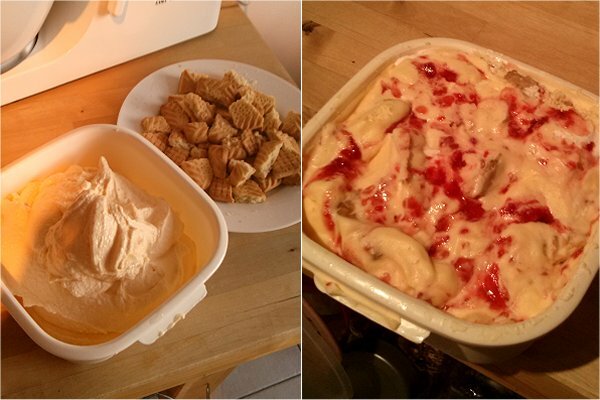 For the previous entry in the series, I used Angel Delight ice cream mix as the base - and although I considered it a resounding success, this time I wanted proper ice cream... the dense, heavy, creamy stuff. But I'm not the sort of person to do things the hard way, so instead of making a custard base from scratch, I used a mixture of ready-made custard and double cream. It was then time to hijack my wife's favourite kitchen gadget - the ice cream attachment for the mixer. She really hates it when I use her stuff, and she generally stands over me to make sure that I use it correctly, wash it thoroughly (and at the correct temperature), and then carefully dry it and put it away in the correct place. But it was worth the hassle, because the ice cream came out really well... rich, thick, and just generally the way ice cream should be. 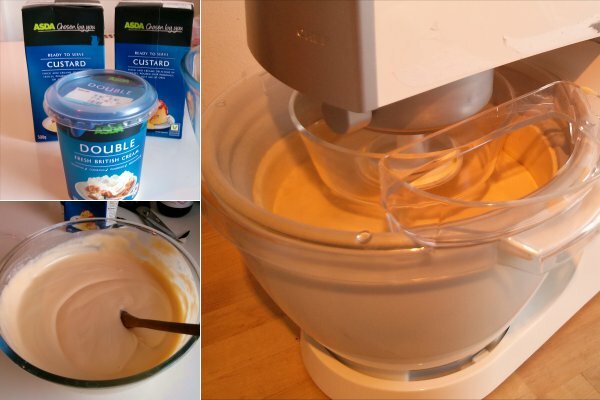 In fact, if you have an ice cream maker, I thoroughly recommend the shop-bought custard method. 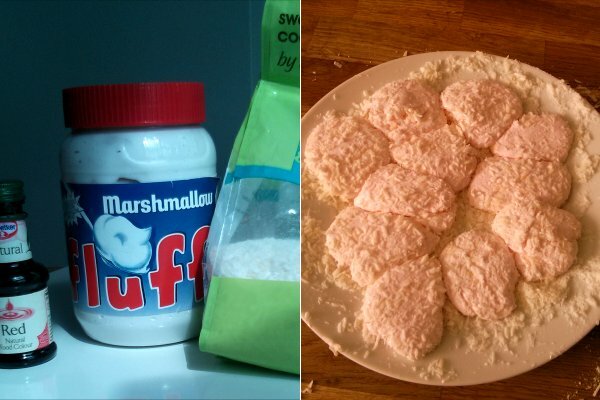 To make the pink marshmallow, I stirred a few drops of red food colouring into half a jar of marshmallow fluff. I then spooned out a few blobs of the stuff, and coated with coconut. Marshmallow fluff is one of the stickiest substances known to man, and it seems to get everywhere, but eventually I had ten or so nice lumps of coconut coated pink goo. I took some bog standard shortcake biscuits, broke them into small pieces, and stirred them into the ice cream along with the marshmallow. Finally, I made a raspberry "sauce" from a handful of raspberries and some jam, stirred it into the ice cream, and put the whole lot in the freezer. The result was another delicious biscuity success. And it tasted even better with some extra raspberry sauce and coconut sprinkled on top. This is good, but Viscounts next yes? Yeah... but what sort of biscuit would be suitable for the Viscount biscuity pieces? I just can't decide. Mint Clubs would confuse the issue. You need a kind of digestive biscuit (or maybe shortbread if you're falling into line with the modern rebranding of the Viscount as a "luxury biscuit", some form of mint fondant (peppermint cream chunks? Retro in themselves) and chocolate. I reckon you can solve his one.